We’re tightening the boot straps in a little bit more, but still trying to eat sensible dinners. Not always the easiest task. It helps that it is wrestling season and the boys are more mindful of what they are eating. What I notice is that everyone is eating much more sensible portions. I love that. Food stretches farther, and they are willing to try an even larger variety of food because the meals are geared to fueling the body, streamlined. There is definitely some not-as-good foods still floating around here, but I find I’m not making as much and we are still getting by amply. Even if I make a greasy, gooey batch of mac and cheese, a smaller dish will feed us fine. I really, really appreciate that. For my budget, and for my own waistline. Take one can of salmon (I currently use Wild Pacific, though I wish I could afford Wild Alaskan Sockeye, a better choice), and use a fork to mash it up in a bowl with a couple tablespoons of mayonnaise. I also add some salt and pepper, and Spike (a healthier version of seasoning salt, made with lots of dried veggies), and garlic powder is good, too. Take 5-6 pieces of bread (depends on bread size and how thick you spread the salmon) , and spread salmon mixture on them. Cover with sliced or grated cheese. Put in the oven at 350 F to bake for about 10 minutes (I often just use my toaster oven to save energy). Allow to cool for a minute and that’s it! I picked up a loaf of crusty bread from the store, had them slice it, and grabbed 1 more can of salmon (I already had one). Doubling the recipe, and using a 1/2 slice of provolone each, I made enough for all 6 of us to have 2 sandwiches (well, Franny had 1), and we had 1 left over. For my seasoning, I used Old Bay Seasoning in mine (I love that stuff). It was warm, crusty, tasty and hearty. Oh – and easy! On the side we had a pasta salad. I also had chips on the table, but nobody touched them. Shocking! Once again, I’m blogging daily from December 6 to January 5. Live with it. They’re using a slightly different system this year and I hope I can get the hang of it before the end of the Holidailies run, but who is to say. I don’t think I like it already, but maybe it will grow on me. OK so pizza crusts in the bread maker– or rather, momma hasn’t done much of meal-planning since Thanksgiving and she’s flying by the seat of her pants. That’s probably more appropriate. Wednesday I made a quick run to Costco while Sal was at goalie practice, and I worked hard not to buy for the sake of buying, but to be thoughtful in what I needed. Of coarse, that means I needed to recall just what it was I needed. Need, need, need. Noodle bowls. Ham. Shredded cheddar cheese… gum, sour cream, Sobe. I didn’t so much need the peeled baby carrots, come to find. But I picked up a HUGE bag anyway (sigh). I’ve been spreadsheeting it out to see what really IS a deal and what IS NOT a deal at Costco. So far it looks like I’m getting decent deals. Just don’t buy the vinegar there. Not a deal. As I was walking the isles, I decided that I would be making pizzas. The huge bag of shredded mozzarella was calling me to make some pizzas and possibly a casserole. In the cart it went (I did end up making crockpot lasagna and I WILL post the recipe this week). Back to the pizzas. Now that wrestling season has started (and winter soccer trainings, indoor soccer leagues), life has swung back into crazy gear again. The plus is that Frank coaches and all 3 younger boys are in wrestling at the same time. The not-so-plus is that Dante is just finishing up wrestling (for high-school, they use the same mats as the youth wrestlers), and needs to come home just as Frank is arriving with the boys for their mat time. That means I have to go pick up Dante. Before the youth wrestling started, I’d have dinner ready to go when Dante got home (ravished), and we’d all sit down to eat. Now that we’re on different schedules, it isn’t so easy. It’s only 2 days a week, though, that that happens, so I can’t complain. Basically what I’m saying is, even though all the boys are occupied, it isn’t a real down-and-dirty “work time” for me because I’m running around in between cooking dinner. Last week on one of those days, I thought I’d be all Ms. Smarty Prepared and start a pizza crust in the breadmaker before I left, come home and start up some pizzas. That would have all been find and dandy had I not set the bread to “Quick Bake” instead of the “Dough” setting. I didn’t actually realize that was the problem, not right away. I thought that maybe there was simply something wrong with my bread maker. I mean, it is a little bit on the older side. But I had made calzone dough in it not too long ago, so I couldn’t figure what went wrong and why my bread maker was so warm. The kids munched on the “bread” and said it was good (they were just hungry). I turned into Maniac Mom, panicking, stressing, hyper-cooking. Refusing to change directions. We were having pizza if it killed me. And it nearly did. I worked on mixing up a dough that didn’t need to rise or be beaten, thinking that at least they could start on that, and if nothing else worked, their bellies would be satisfied. But, in tandem, I also put another batch of dough in the machine. Well, that’s not true. I intended to put a batch in, while the kids hovered, squawked and asked questions that my brain had to work to answer. Everyone asking me questions and getting in my way makes my head start to sputter and blow smoke. 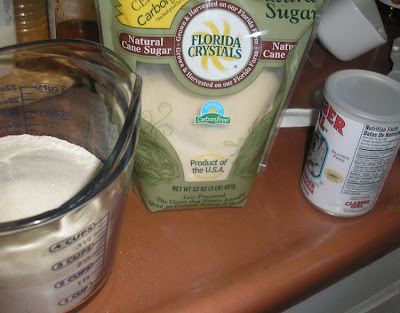 The distractions caused me to add the ingredients to the machine in a fashion that would have rendered yeast-less dough. I had to toss that batch. Next attempt went fine, although I realized I screwed up the other no rise/beat dough, adding double the yeast. At this point I was about ready to glug down some spiked eggnog and go lay in a snowbank somewhere. Forget dinner. The first pizza to arrive on the table was the no-knead. Pepperoni and banana peppers. No picture. Second pizza was another no-knead (still waiting on the bread machine to finish its job). Italian sausage and banana peppers. Third pizza was with the “regular” knead-and-rise dough, though I didn’t quite let it rise all the way because we were hungry and I was sick of playing pizza-maker. I used half the dough on 1 pizza and the rest I put in the fridge. They were all OK, but I prefer the knead-and-rise dough. Frank liked the sausage and pepper one, but got horrid heartburn from it. Sal liked everything. They must have all liked the pizzas enough because what they didn’t eat for dinner, they ate the next day. Every time I make homemade pizzas I wonder why I don’t do it more often. Story of my life. I made a breakfast pizza with the remaining dough. It was also a hit. Again, Bowzer wondered when he would get his. Don’t judge us because we don’t take our dog to the groomers. All the boys have long hair at some point. Another day of feeling under the weather. Better, but still riding the wave of fatigue. Even though I worked at home today, I took the majority of the time off. I ran some basic errands (stopped at the office, then to Goodwill) and came home. That’s about all I could handle. Wrestling started today for the boys. They were pretty excited. Frank’s one of the coaches. Now that he’s on first shift it is so much easier. I don’t know how we made it through last year with him on second, the boys all needing to be somewhere at the same time, and me with one car. Thankfully I had a casserole frozen and ready for evenings like this. It takes some planning, but it really is helping us to stay in better shape financially. Just knowing that I had dinner semi-prepared, in the oven baking was peace of mind. I used this Cheesy Beans & Rice Casserole recipe one day after making a load of kidney beans and having nothing to do with them. So glad I did. Everyone liked it, and we had enough for leftovers. My kind of meal. This rice recipe (a variation of it) has made itself a staple in our household over the past couple years. I double it for our family. Generally I heat the rice and spices in the oil for a few minutes, and then add the water. Simmer for 20 minutes, remove from heat. I take the lid off for 30 seconds to allow the steam to escape, but I’ve yet to see a rice recipe that calls for that. Doesn’t stop me, though. I let it sit a while before fluffing. We’ll eat this the first night, sometimes with sausages mixed in, but usually as a simple side. Last night we had the rice, warm tortilla chips, corn (from Costco, organic and frozen – very good) and tilapia. Decent dinner. I had about 4 cups of rice leftover from the meal so last night I put 2 pounds of black beans in to soak overnight. Today before work, I rinsed them and threw them into the crockpot, covering them with water, adding about 1/8 cup dehydrated onion, 1 T. dehydrated garlic, a bit of black pepper and a bay leaf. I let that sit on low for about 6 hours, then kicked it up to high for another 2 hours when I got home from work. After that, I removed 3 bowls full of beans and some liquid (about 2.5 cups each) to freeze for when I need black beans, and added some sausages in to the remaining beans. This cooked for a couple hours. After it was done I removed the sausage. The beans I fished out with a slotted spoon and mixed in with the leftover rice. 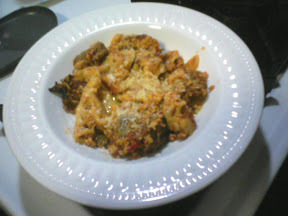 I put that in a small casserole and topped with a bit of cheese, set it under the broiler to melt the cheese. Dinner was the sausages, rice and beans, corn, warm tortilla chips. It went over well, and was a very cheap meal to eat. The sausages were from Costco (it was a 12-pack that I split over 2 meals), as were the chips (priced as a substantial savings over bying the same chips at our large grocer). It is so nice to be able to sit down at the table with the kids to a warm meal. I feel spoiled! The past couple days I’ve intentionally “shopped the freezer” to whip up a couple of meals. Tomorrow I head back to Costco, and possibly the regular grocer (time allowing) to pick up some items for some of the meals I have planned. This all makes up for the complete glutton-fest I had today as I stopped by my favorite little restaurant to get my Peruvian chop bowl with cilantro rice and arepas, spending $10. Thankfully it was enough food to allow for 2 lunches for me. But still it was totally unnecessary. Old habits are hard to break. A few recent expenses and a desire to get rid of debt has led me back on the path of increasing my time spent meal-planning and finding cheap (but healthy) meals for the family. It is not easy to feed 4 hungry boys, let me tell you. Earlier this week I shopped my pantry and found a big bag of dried kidney beans. I soaked overnight and threw them in the crockpot the next morning before work, planning a dinner of beans and cilantro rice. I was a bit skeptical over how it would be received, to be honest. No meat, and just beans. And rice, of coarse. After the beans cooked on low for a good 9 hours, I finished them for 1 more hour on high, then transferred the majority over to a skillet where I heated them with some canola oil, garlic, pepper and and onion. After they were a bit mashed and bruised-looking, they were ready. We ate them with heaping plates of warm tortilla chips, shredded cheese, sour cream and cilantro rice. Yum. However, a few days later I was at a loss over what to do with the remaining beans. I had already made chili recently, and having more beans and rice probably wouldn’t cut it. Instead I put the beans (about 4 cups or so worth) into the bottom of my cast iron pot. I added about 1 tablespoon of minced garlic, 1/2 cup of water, and a package of Hidden Valley Ranch seasoning mix while heating it a bit on the stovetop, then added 1 package of beef sausages on top*, lidded it and put it in a 350 degree oven for 2 hours. We went to pick up the kids at the mall and run a few errands, and by the time we got home the house smelled delicious. The sausages were plump and tasty, the beans were delicious. We had baked potatoes on the side (made earlier in the crockpot). I love it. Tonight, with all the running around we did, could have very easily spent $30-plus a night of pizza, burgers or take-out because of poor planning. But a little bit of thinking had me using up some beans I would have possibly tossed out, and putting a meal on the table for much less than one that was store bought. *These were Usinger’s beef dogs purchased from Costco. They come 12 to a pack, divided into 2 packs of 6. Because they were large, I cut them in halves to make 12 servings. I do this quite often because, for some reason, eating 2 halves rather than 1 sausage makes it seem like you’re eating more. It’s much easier for me to give some of the boys 1/2 a sausage and then give them seconds, rather than start with the whole thing. This isn’t necessary for all of my children, but there’s a couple that prefer quantity over quality. Two very good things in one not-so-good photograph (I used my phone). 1.) New bowls (Goodwill find… been spending too much time there lately). We eat a lot of pasta, casseroles and the like. I’ve been looking for some simple bowl/plates (like pictured, the size of a salad plate, with indentation) to serve our one-dish meals in. We generally use salad plates for dinner (perfect size, helps with portion control), and these looked to hold just the right amount. A bit of a rim to keep the contents in, or hold bread on. Perfect. $1.99 each. A little pricey for my tastes, but the ones I’ve been looking at in the stores were double or triple that. I got 6 of this style and 2 of a different style, .99/each for those. Mixing and matching is fine by me. 2.) Crockpot lasagne. Mmm. Nice and easy – and ready to eat when I come home. Saves me money. It is one of our staple meals now. 1/4 of what was left of a “seasoning” bag of frozen veggies (chopped onion and peppers). Busy night, thank goodness for pre-planning a meal. What could have turned into a$20 plus drive-thru meal, was instead a 15-minute prep and eat meal. And it was good, just as good as if we were to eat out. It is satisfying to save a little bit of money. I realize that there are definitely times where our family needs to stop somewhere, shove some food in the kiddo’s mouths so they can eat and get some shut-eye, but I would much rather those days be lessened, and not feel like they are forced. I really prefer it to be enjoyable to eat out, rather than necessity. It’s been a bit since I’ve posted, I know. I took a little break. My husband and I had a few days off together, and we spent our time doing non-essentials, as well as essentials that relieved us of some stress (getting some papers handed in, meal-planning, etc.). Today, after 2 days of slowly gathering my coupons, and some meal-planning, I finally went grocery shopping. My budget was $400, with stops at 2 stores (Sam’s and our local mega-grocer, Woodmans). I spent a little over $100 at Sam’s and $340 at Woodmans (saving close to $19 with coupons). There were a few things I didn’t get, because I know it would have put me over budget and we can live without them until Frank gets paid on Thursday, but for the most part, I got enough to make meals each night, and fillers for lunch and breakfast. Tonight we had Turkey Maid-Rites. I wasn’t sure how they would go over, but by putting the ingrediants in the crockpot this morning, we were able to have early dinners (for those of us ready to eat early) and then later dinners (for the hungry footballers after practice). I absolutely love to have my meals “planned” for the most part. Ingrediants on hands, recipes picked out really does help and saves money on quick, thoughtless trips to fast-food, or ordering pizza because there’s no time or brain power to throw together a meal. Next week the kids go back to school (already), so lunches will be eaten outside of home for the most part. I hope to also be able to start making ahead some meals, too, in addition to planning things out a bit better. It is still, technically Monday. Not too late for a weekend wrap-up. We did a lot this weekend. Friday night we went out with my brother, Frank’s cousin and a couple friends. It was a long night, but a nice time. We covered lots of ground, had plenty of fun, and finished the night off at a favorite Mexican restaurant with a delicious platter of shared food. Saturday I woke up and made pancakes. Mmm. Later, we bummed around and then stopped at an anniversary celebration (parents of a boy on Dante’s soccer team). Got to catch up a bit with folks we don’t always see. Then it was home to watch some television with the family. The next day we went to an impromptu soccer tournament, local festival where we played BINGO and the kids played some cheap games to win cheap toys. Oh, and I made waffles Sunday morning (they didn’t turn out so well). Nice weekend. 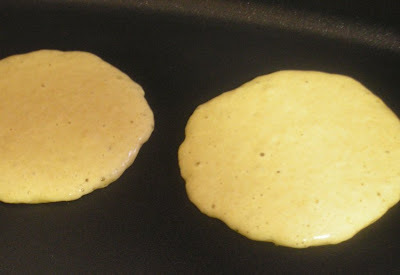 But back to the pancake-making. 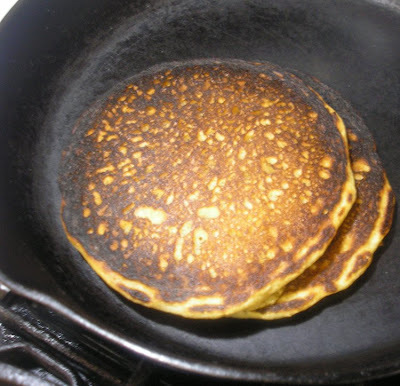 My mom’s been making buttermilk pancakes for the boys for lunch the past few weeks on occasion. She’d watch them (actually, she’d entertain them) for a few hours while I went in to work, and they would delight in some of her “famous,” “best-ever” pancakes. I’ve been requested to make them at home, but keep forgetting to get the recipe. So I had to improvise. A try at it last week left me with some not-so-good ‘cakes. 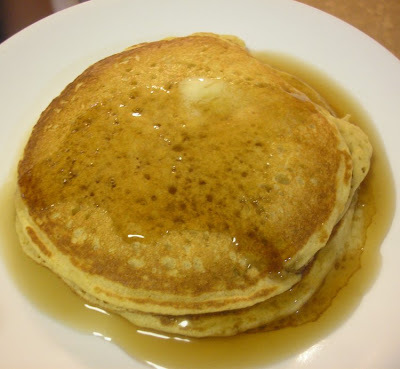 But this recipe for Buttermilk Pancakes was a keeper (not only is it a keeper, but it introduced me to Google’s Knol, which is pretty darn cool). 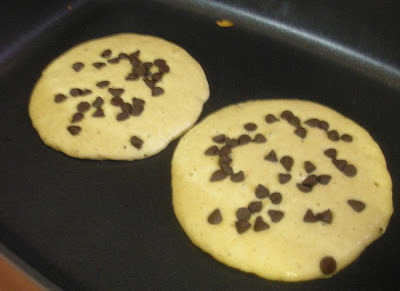 For Franny and Dante, who love chocolate chips. 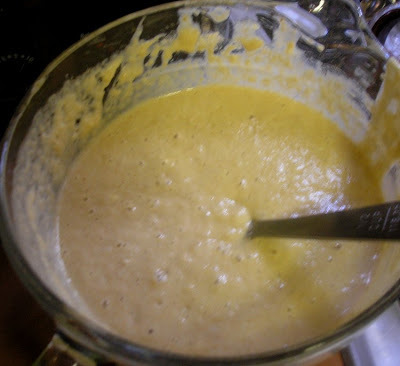 It was a yummy recipe, with great instructions (read the instructions, if you like making pancakes… I like his way of mixing in 1/2 of the dry to wet, and then mixing in the rest of the dry). I tried using it for waffles and it was a bummer; didn’t work. But that’s OK. It makes delicious pancakes. 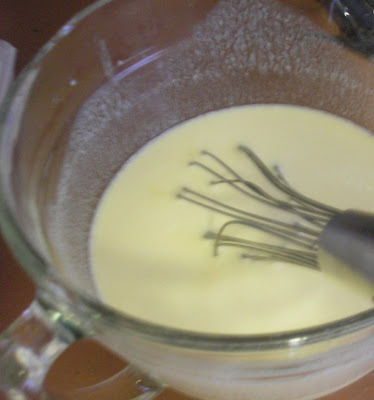 Will have to make a point of getting my mother’s Famous, Best-Ever Buttermilk Pancakes recipe to compare. 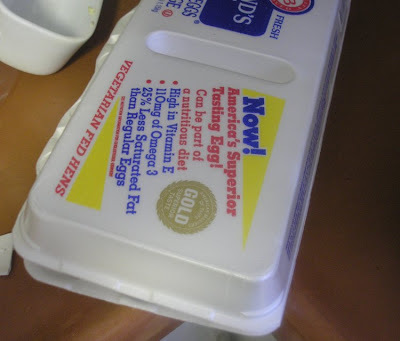 I have 2 coupons to give away, courtesy of Eggland’s Best Eggs (they sent me some for me and some to share). Simply leave a comment here telling me what you’d use the eggs in and I’ll pick a random winner on Friday. Make sure you use an email address I can contact you with. 🙂 Yup, that’s it. You don’t have to follow me, you don’t have to blog about it. Just leave a comment so I have a way to contact you.